Fanning the riverbed of human psyche with the tireless fin of academia, soft-rayed with the sweeping reach of interdisciplinary research, Art and Intimacy gradually unveils the shared origin of love and the humanities, which rock with the tidal urges of evolution. Dissanayake initiates an exhaustive (and humble) departure into the realms of numerous disciplines, including infant psychology, evolutionary theory, cognitive science, neuroscience, physical and cultural anthropology and aesthetics, in an effort to successfully balance her work and promote her thesis. 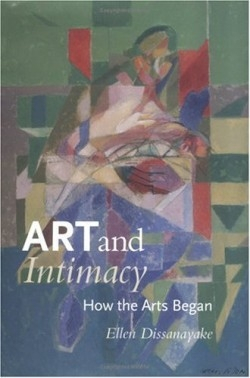 Proposing that infants and their mothers engage in a rich exchange of love via their dually created set of “rhythms and modes,” Dissanayake maintains that this natural and evolutionary effort to satisfy inborn human needs is the original fertile ground from which adult love, and the arts, flourish. The first of the innate needs explored is the mutuality between mother and infant, as Dissanayake emphasizes this fundamental interaction far beyond traditional evolutionary theory. Mutuality, in turn, impacts ability to belong to a social group, find/make meaning in life and feel competence through creating with the hands. The final need for elaboration is, in essence, art itself—the expression of one’s fulfilled basic needs, or expression of identity. Decidedly aligned with her previous works, which similarly delve deep within the primordial depths of art and evolution, Dissanayake’s Art and Intimacy emerges with both subtle urgency and cool intellectualism. Far beneath the enveloping wash of pages drifting past, lovers of the arts may find themselves breathing the waters of its theory, and wary of modern culture—with its air of artificial prosperity and purpose which sear the lungs.